Floral Bouquet is a soft blue floral scheme, with custom folders, trash, cursor, desktop pattern, utility pattern, subtly-patterned finder header, menubar and menu, and windowshade sound, all written *into* the scheme. You select which you want to use. 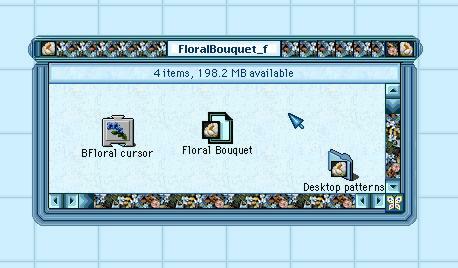 It has a lovely floral bouquet in the scrollbars, flower widgets, and butterfly grow box! Folder includes extra desktop patterns. You will not tire of this scheme on the desktop.